The extraordinary media coverage regarding the disappearance of the British 3-year- old Madeleine McCann emerges as an illustrative example of a ‘public drama’ and ‘trial by media’. This article presents a comparative analysis of the perspectives and narrative devices employed by two Portuguese newspapers in establishing a dialogue with their respective audiences. High-profile mediatized criminal cases have the potential to linger in the public memory and become cultural references which may affect long- term public representations of crime and justice. Our analysis is limited to a sample of representative Portuguese newspapers. We found a basic distinction between ‘quality’ and ‘popular’ press which may be related to inherent differences of their market and implicit audiences. A distanced, neutral and reflexive style of the quality press contrasts with the construction of a sensationalistic narrative by the popular press. The latter provided the audience with a daily dose of vicarious participation in a criminal drama which developed into a trial by media, sustained by a rhetoric that encourages the audience to ‘take sides’. Sensationalist media narratives can potentially undermine the principles of fair trial and the presumption of innocence. But they can also elicit relevant collective energies directed at starting processes of change. The media are a key arena through which notions about crime, criminals and suspects, victims and their families, criminal investigators and the criminal justice system are played out. Although the manner in which the public receives information is not passive and uncritical (Ericson, 1991; Sacco, 1995), a great deal of knowledge concerning crime and the legal system is conveyed by the media (Ericson et al., 1991; Surette, 1998; Robbennolt and Studebaker, 2003; Fox et al., 2007) and the public perception of order and disorder is closely related with its media representations (Ericson et al., 1991; Altheide, 1992; Reiner, 2002; Barak, 2007). This article explores the ways in which the Portuguese newspapers’ reporting of a case that has attracted unprecedented global media attention – the Madeleine McCann case – offers illustrative examples of ‘public drama’ and ‘trial by media’. It is argued that the press representations of the actors involved in this particular criminal case – the family, the police investigators and the suspects – may contribute to shaping popular stereotypes and symbolic meanings regarding the justice system, criminal investigative processes and practices and the police in Portugal (Altheide and Devriese, 2007). However, the Portuguese press may have done more than this. As suggested by Cottle (2005), the media coverage of high-profile mediatized and emotionalized events has the potential to catalyse and energize society’s moral and symbolic structures in different ways, whether through the assertion of prevailing values, agencies and practices of social control or by setting in motion processes of change. Our argument is based on the analysis of news articles in two Portuguese news- papers – Público and Correio da Manhã – that we consider to be representative of distinctive orientations regarding style, target audience, balance between the right of information and ethics of conduct, and the access and use of information sources. It is claimed that the Portuguese press coverage of the case adopted two distinct approaches. On the one hand, there was a more distanced and reflexive stance which balanced the right of information with the necessary ethical posture of quality journalism. On the other hand, a ‘popular’ and more sensationalistic approach appeared committed to the construction of a criminal narrative, often closer to entertainment than information. In this article, we seek to establish what narratives and rhetorical devices were used by these two newspapers to thematize and frame their coverage. We consider how differences in reporting a specific criminal event can impact in the construction of public drama and trial by media. Furthermore, we explore how these newspapers’ narratives may connect with the audience’s framing of social order and disorder, and of criminal justice effectiveness and efficiency. It is suggested that this story of major public interest in Portugal and in Britain, which has attracted unprecedented media attention, represents a good example of trial by media in the sense that the media sometimes exercise parallel functions of justice, potentially fulfilling in the eyes of the public a role that lies beyond the capacity of institutional justice (Commaille, 1994). In addition, we examine how the Madeleine McCann case was constructed as a public drama. Content analysis of coverage in the two Portuguese newspapers provides empirical support for this article’s claims. The Madeleine McCann case can be seen as an example of the commodified (sic) production of an emotional collective consensus through the construction of ‘public dramas’. Such public dramas can actively contribute to the framing of visions and perceptions of crime and social order (Reiner, 2002). According to some authors, the media’s intense focus on and reporting of exceptional criminal cases also tends to foster distorted and negative public perceptions of the criminal justice system, particularly regarding those cases in which the prevailing policies and social control institutions fail to provide adequate and consensual responses (Surette, 1998; Reiner, 2002; Vinson and Ertter, 2002; Fox et al., 2007). Furthermore, the media’s dramatized coverage of criminal cases holds the potential to discharge and invoke intense emotions, directing emotional and moral force into society (Cottle, 2005). The media coverage of a high-profile crime can thus steer the flows of consensual visions of justice, law, crime and social order, widely shared among diverse audiences, and produce outcomes of social, political and legal significance (Barak, 2007; Fox et al., 2007). This criminal case had particularly high newsworthiness and entertainment potential and remained the focus of extensive media attention during a relatively long period of time. Mostly the sensationalistic media moulded their coverage into ‘infotainment’, a format which merges information with entertainment (Surette and Otto, 2002; Fox et al., 2007). The Madeleine McCann case has also offered the ingredients of what Ray Surette (1998) calls ‘media trials’ or what Fox et al. (2007) term ‘tabloid justice’. ‘Media trials’, in Surette’s (1998) words are ‘regional or national news event in which the media co-opt the criminal justice system as a source of high drama and entertainment. It is, in effect, a dramatic mini-series built around a real criminal case’. As suggested by Surette (1998) we could define a trial by media as the media frenzy following the discovery of a crime and which precedes the court trial. The media engage in a search to find the ‘truth’ and uphold the public interest. However, public interest can be transmuted into audience interests, which can affect the news-making process’s standards and priorities. Thus, crime news reporting can be formatted into a drama that can be explored as any other popular and lucrative mediatized cultural form (Jewkes, 2004). Therefore, we will explore how this case might exemplify a trial by media in which the popular press acted as the public’s proxy in the demand for justice (Reiner, 2001). We begin with a brief description of the Madeleine McCann case, followed by a review of the theoretical background, which considers Moira Peelo’s (2005, 2006) concepts of ‘public narrative’ and ‘mediated witness’. These concepts help to structure an interpretative framework within which we explore Portuguese press coverage of the case as a prolonged, complex and highly emotionalized crime narrative. The duration and intensity of the case coverage was nourished by narrative devices that engaged the audience as ‘mediated witnesses’ and sustained readers’ interest through emotional engagement and investment. The Madeleine McCann case concerns a British 3-year-old child that was reported missing in Portugal. In May 2007, a couple of British citizens (Kate and Gerry McCann) were on holiday in Algarve, in a resort in Praia da Luz called Ocean Club, with their three children (Madeleine, 3, and Sean and Amelie, 2-year-old twins). Initially, it was thought that the little girl had been abducted from the room where she was sleeping with her siblings, while her parents were dinning with friends in a restaurant inside the holiday complex. Il serait plus juste de dire que les parents déclarèrent d'emblée que leur fille avait été enlevée (pour preuve une fenêtre et un volet qu'elle n'aurait pu ouvrir toute seule, même si finalement personne n'était passé par là) et le répétèrent tant et si bien et avec l'appui des autorités diplomatiques que la PJ dût s'incliner (car aussi l'enfant semblait introuvable). Along with the largest police operation ever set up in Portugal to find a missing person, the weeks that followed Madeleine’s disappearance would also trigger massive international media interest. The initial investigations by the Polícia Judiciária (1) and its scientific laboratory technicians were not able to find any clues of Madeleine’s whereabouts or any signs of a perpetrator. On 15 May, a man that lived close to the Ocean Club was identified as a likely suspect and made an arguido (2) but there was never strong evidence against him. The case took a spin in July 2007 when the British police brought in two dogs trained to detect odours of tissue putrefaction and blood. The dogs discovered biological traces in the McCanns’ holiday apartment, as well as in their rental car. These traces were collected and sent to a British laboratory (the Forensic Science Service in Birmingham). On 7 September 2007, after an interrogation by the Polícia Judiciária, the Ministério Público (Prosecuting Counsel) decided to make Madeleine McCann’s parents arguidos under the alleged pretext of suspected murder and concealment of the body. Il faudrait expliquer à quoi sert le statut d'arguido (témoin assisté). No formal charges were made, and on 9 September 2007 the couple and their other two children returned to their home in England, maintaining their commitment to find their missing daughter. After their departure from Portugal, news coverage focused on the possibility of arranging further interrogations as the police awaited the final reports from the UK’s Forensic Science Service. On 7 January 2008, sections of the Portuguese media announced that the final results of the scientific exams pointed towards a ‘strong’ probability that the blood found in the McCanns’ apartment and car was indeed Madeleine’s. Cette rumeur provient d'un seul organe de presse, de genre tabloïd, rien ne l'étaie dans les PJFiles. However, a few sources reported in some Portuguese press that the forensic evidence may not have be enough to render a robust prosecution. On 19 March 2008, after the McCanns threatened the media with defamation lawsuits, they were given substantial monetary compensation and front-page public apologies by some newspapers owned by the Express Newspapers group. On 21 July 2008 the investigation was finally closed by the Ministério Público due to lack of evidence of any crime being committed by the three arguidos, Robert Murat, Gerald Patrick McCann and Kate Marie Healy. Through the analysis of two Portuguese newspapers’ coverage of the case, our purpose is to look into the ways in which the Madeleine McCann case was constructed by the press and how this may impact on public understandings of crime and justice. We consider the concepts of ‘public narrative’ and ‘mediated witness’ to be essential, insofar as they facilitate a wider analysis of the cumulative emotional and dramatic elements of the press coverage that might help to shape public perception. If crime can be said to be almost ‘naturally’ newsworthy, crimes involving children, as victims or offenders, are especially so (Jewkes, 2004). The media coverage of paedophilia, infanticide or child abuse is routinely accompanied by calls to better protect children against a multitude of dangerous ‘evil strangers’ and sexual predators. Yet only a small fraction of such offences appear in the official statistics, and even fewer receive sustained attention in the news media. The disappearance of three-year-old Madeleine McCann on May 2007 in Portugal contained all the ingredients for an exceptionally newsworthy crime narrative. The story of a white, middle-upper class child, suspected to have been abducted by an unknown child predator or an international paedophilia ring was always likely to receive considerable coverage. However, mainly due to the exceptional organization and involvement of the child’s family and public relations specialists, the Madeleine McCann case attracted unprecedented and enduring media attention. High profile crimes are often constructed as ‘human interest’ stories that have the potential to express, explore and contain public or social emotion (Peelo, 2006). Such reporting can also lead to disproportion, exaggeration and alarm (Garland, 2008), ultimately constituting what might be called a ‘public drama’. The disappearance of Madeleine McCann mobilised unusual investigative means and resources in the search for a missing child, as well as broad public awareness and concern regarding cases of missing children. It also provided an opportunity to create political pressure towards the implementation of a European ‘amber alert’ for missing children. Ce projet existait déjà depuis des années et existait déjà dans plusieurs pays européens, dont la France. Le Portugal allait l'adopter avant le Royaume-Uni. Un groupe de pression pour l'implanter au niveau européen a eu l'idée de faire intervenir les MC, d'ailleurs alors principaux suspects, ce qui n'est pas sans saveur, a fortiori parce que, si l'alerte européenne avait existé, elle n'aurait jamais été déclenchée pour MMC, puisque il n'y avait ni indice ni témoin d'enlèvement. Mediated witness’ is the paradoxical phenomenon of virtual experience in which detail about a homicide is communicated in a way that engages us personally and emotionally on the side of those who are hurt. As witnesses to the drama, we are invited to focus our attention on and emotionally align ourselves with victims, co-victims and survivors of homicide. Peelo’s concept of mediated witness is useful because it contributes to an understanding of the ways in which narrative techniques are employed by news producers in a ‘media logic’ (Altheide, 2002) which operates to elicit an emotional involvement that ‘is not just a personal response but one that has the potential for collectivity’ (Peelo, 2006). The individual emotional involvement with crime victims has potential for collectivity insofar as it stands as an appeal to ‘all decent people’ (Peelo, 2005: 33). The mediatized disappearance of Madeleine McCann elicited a strong collective concern and anguish insofar as audiences were invited to experience the child’s parents’ feelings of victimhood, as well as disgust and moral condemnation towards them when suspicions of their involvement in their daughter’s disappearance were raised in the media. The construction of crime narratives featuring details about victims and offenders, their families and social contexts, provoke emotional responses by encouraging readers to relate the events to their own experience (Katz, 1987). Susanne Karstedt (2002) argues that the ‘emotionalization’ of public and political discourses about crime is a characteristic of the public sphere in late modernity. The author states that the media engage their audiences in a form of ‘distant suffering’. According to Luc Boltanski (1999), representations of real suffering are more likely to be apprehended in a fictional mode if the spectator is receded into a far horizon from the actions or events. The Portuguese audiences’ cultural distance to the protagonists in the Madeleine McCann case was an element which contributed to the construction of a ‘public drama’ that had emotional appeal, as human tragedy, while simultaneously allowing entertainment features. As suggested by Cottle (2005), the media representation of high profile criminals simultaneously arouses and shapes intense public emotions, generating an emotional and moral force which can be projected back into society. The media can then contribute to affirming the power of the justice system and the police, or to opening up processes of change. Following that argument, we will explore reporting differences between ’quality’ and ’popular’ Portuguese newspapers and suggest how they provide positions of cultural reflexivity related to the public perception of crime, law and social control. The media sources selected for the study here are two Portuguese national daily news- papers, the Público and the Correio da Manhã. Both papers have been reporting devel- opments in the Madeleine McCann case since the beginning of the case (May 2007) and its legal closure (July 2008). We selected these two titles based on the traditional style differences between ‘quality’ and ‘popular’ press, which the Público and the Correio da Manhã represent in the Portuguese media market. These newspapers can be said to stand at opposing poles within the journalistic field, the ‘intellectual’ and the ‘commercial’ (Bourdieu, 1994). The findings of previous studies regarding the Portuguese press on matters such as science communication (Mendes, 2003) and the media representation of crime (Guibentif et al., 2002) pointed towards differences in the socio-economic status of their target audiences. The Público is directed at a higher-income, more highly educated readership, while the Correio da Manhã is aimed at a lower-income, less highly educated readership (Guibentif et al. 2002). The differences in target audiences represent, according to Bourdieu (1994), a tradition dating back to the 19th century which contrasts one journalistic style which privileges ‘commentary’ and marks its distinction by praising its values of ‘objectivity’ and ‘impartiality’, with another style which privileges ‘news’, and preferably ‘sensationalist’ news. For Bourdieu, the opposition also configures a tension between two different logics and principles of legitimation: one (‘quality’) which values recognition among its peers and the upholding of journalistic principles, and the other (‘popular’) that draws its legitimacy from a sort of democratic plebiscite reflected in the sales. The market orientation differences between ‘quality’ and ‘popular’ press stress the inherent nuances in style and format. The ‘quality’ press seek public acceptance by offering a more literary and symbolic style. This style translates into longer news items on more complex political and economic matters, often concerning national and international events. The correct use of language and accuracy of reporting is also a staple of ‘quality’ press. In contrast, the ‘popular’ press speak to the ‘on the ground’, everyday reality of their readership, employing a livelier and more entertaining style of reporting grounded in a colloquial language The focus here is on the production of brief and straightforward reports on issues of local interest, accompanied by strongly opinionated columns (Ericson et al., 1991; Sparks, 1992). 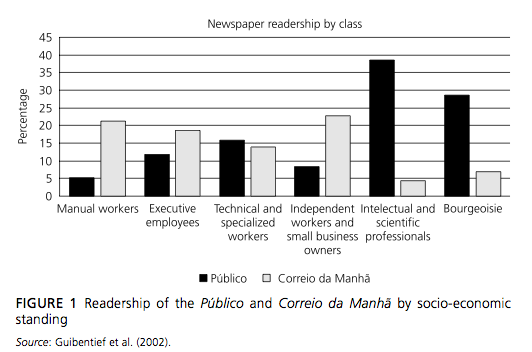 Figure 1 presents data regarding the social standings of Portuguese newspaper readerships collected by Guibentif et al. (2002) in their analysis of crime reporting in the Portuguese press. The authors used a class and stratification typology proposed by Almeida et al. (1994) which initially had 11 categories, but was aggregated into six simpler ones that translate social class according to education levels and profession. There appears to be a clear pattern in the social class distribution of each newspaper’s readership. More highly educated and professionally specialized individuals state a preference for the Público, whilst the Correio da Manhã is preferred by less educated and less skilled professionals. The social class differences in readership distribution implicitly affect the role of ‘emotions’ in the newspapers’ journalistic style: while the quality press’s literary and careful use of language translates into efforts of objectivity and impartiality which serve informative and explanatory purposes, the popular press’s colloquial use of vocabulary emphasizes more emotional and implicit understandings (Katz, 1987; Ericson et al., 1991). It is important to stress the relationships and type of dialogues established between a newspaper’s style and the characteristics of its audience because, according to Green (2008), the audiences’ ‘cultural predispositions and self-identities impact in the success and resonance that certain kinds of rhetorical strategies and discourses have when presented’. The Madeleine McCann case’s key developments, indicated in Figure 2, refer to the intervals between major events. The first interval ranges from the beginning of the case until the McCanns were made official suspects in the investigation in September 2007. The second interval spans from the end of the first period until January 2008, when the final results from DNA analysis arrived. Finally, the third interval marks the events since January 2008 until the investigation was officially closed. Our choice of these investigation ‘milestones’, when associated with the volume of news articles, illustrates the level of perceived newsworthiness attributed by each newspaper. The figure indicates that the Correio da Manhã took advantage of the dramatic nature of the case and constructed a serialized narrative with daily episodes. In contrast, the Público adopted a more informative stance, focusing on event-triggered articles. 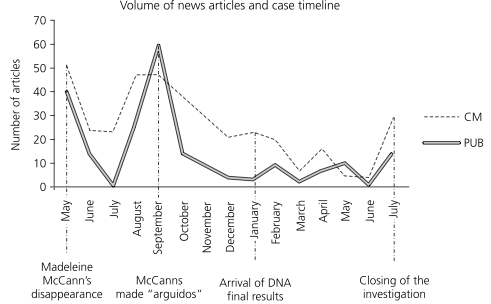 FIGURE 2 Number of news articles and timeline of major events in the Madeleine McCann case is shown in Table 1, with a distribution based on the intervals in which key developments took place. Figure 3 presents the average circulation figures for each newspaper by trimester. 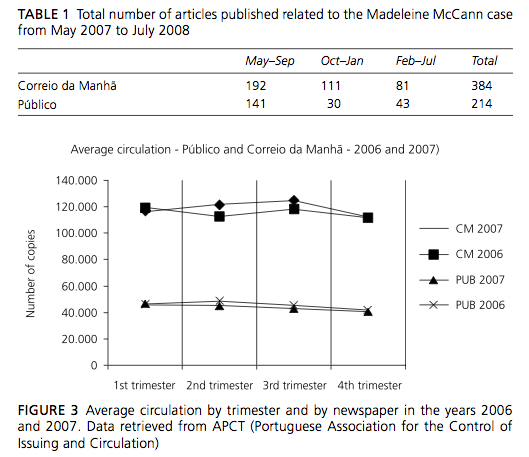 We chose to present data from 2006 and 2007 in order to emphasize the impact that the Madeleine McCann case had in the popular press’s circulation, in contrast to the quality press, represented by Público, which saw a decrease in circulation when compared to 2006 figures. terms of the topics selected for reporting. Exceptions appear regarding in the Media and Science categories. The ‘media phenomenon’ approach was a recurring theme in the Público, frequently appearing as the main side-story in the case. In the Correio da Manhã it was mainly the scientific theme that was approached because of its popular resonance with television drama cultural references and images, such as CSI: Crime Scene Investigation (Cavender and Deutsch, 2007; Cole and Dioso-Villa, 2007). The selection of themes reflects overall differences in the adopted journalistic angle and approach of the case (Green, 2008), which is likely to be related to the editorial policy of each newspaper (Clayton et al., 1993). The difference stands on a more critical and reflexive stance by the Público and a more sensationalistic approach by the Correio da Manhã. We would suggest that it is mainly the sensationalistic media that privilege the immediacy of events and offer the reader a daily dose of vicarious participation in criminal investigation, that nourishes the public drama (Peelo, 2006). Such news generates experiences in individual readers that one might assume are shared by many others (Katz, 1987: 64), thus producing an emotional collective consensus that can actively contribute to the public construction of visions of crime and order. During the first few weeks of the case the two newspapers shared the same angle; that is, compassion for the McCanns’ loss, their deep Catholic faith, and their pro-activity in starting a worldwide campaign to find their daughter. The differences in the coverage of the case started to appear as the weeks passed and the investigations came to a stall. The Público, besides adopting a much more discrete coverage of the case, seemed to attribute more importance to the media phenomenon than the case itself. Our analysis revealed that 18.4 percent of its news about the Madeleine McCann case in the selected period focused on the media frenzy and/or analysis of the reasons behind it. The speculation and wild theories surrounding the McCann case may have led Público to safeguard its status as a ‘quality’ newspaper by ignoring anonymous claims and speculations and quoting mostly from official police and McCann sources. Since new facts surrounding the investigation were scarce, the news coverage itself became newsworthy for the Público. It is important to point out that there were no news articles in the Público regarding the Madeleine McCann case throughout July 2007. There was an extraordinary election in Lisbon during that period which dominated Público’s ‘quality’ agenda, thus relegating the faltering McCann case to a lesser news priority. The more popular and sensationalistic orientation of Correio da Manhã led to an exhaustive and almost daily coverage of every detail of the case, like a serial reality show or, as Ray Surette (1998: 72) would put it, a ‘mini-series’. During some stages of the case, the McCanns’ and the Police’s every move was accounted for in the ‘Film of the Day’ section, as well as ‘The Case Seen from England’ section, where newspaper headlines are reproduced and briefly commented upon. Although there were frequent extracts from the international media, there were only three news articles dedicated to the media coverage itself. The content of those articles mostly points to the global visibility of the case as well as the unprecedented dimension of the coverage, the ‘success formula’ provided by the case’s characteristics and some quotes of experts’ criticism regarding media speculation. This initial framing of the situation and the international media coverage, as well as the constant media scrutiny and criticism of the Polícia Judiciária’s performance, may have delayed the statements of suspicion regarding the McCanns. Even the national director of the Polícia Judiciária, Alípio Ribeiro, would later say in an interview, ‘it would have been immoral if they had named them [the McCanns] suspects at that time’ (Castro, 2007: 35). Englober d'autres enfants disparus fut une idée beaucoup plus tardive. of which Madeleine appears as the icon: ‘The McCanns want to spread the message of hope in the investigation and in their daughter’s return and have, from this day on, the blessing of the Pope’ (Marcelino, 2007). The McCanns’ role in the Público’s narrative was constructed as less emotional, insofar as most news articles relate to campaign actions, personal or spokesperson’s statements, and matters concerning the financial fund created to support the search for their daughter. In August, 2007, the ‘discovery’ by English scent dogs of biological traces in the McCanns’ holiday apartment, as well as in their rental car, precipitated a change in the McCanns’ press image in Portugal. Just as the abduction theory was being abandoned, the ‘face of evil’ shifted from the unknown sexual predator, the random abductor or the paedophilia ring, to the McCanns themselves. Kate McCann’s image was particularly targeted. The McCanns’ ‘guilt’ was approached differently in the two Portuguese newspapers. The Público, in line with its more distanced stance, focused mainly the lack of explanations for the bodily fluids that were collected in the McCanns’ holiday apartment and rented car and that were said to be Madeleine’s, raising the questions that might have been made during the Polícia Judiciária’s interviews. There was no particular focus on any of the characters. The Público pondered the possibility that the supposed evidence wasn’t enough to make a case against the McCanns since there were no conclusive data at that time, just hints and hypotheses. It also balanced the issue of the unanswered questions with interrogations regarding the improbability of the parents’ involvement in Madeleine McCann’s disappearance. Perhaps the most important intervention was the Público’s declaration that the McCanns were under suspicion of involvement in a crime of corpse concealment (Revez and Mesquita, 2007), carefully avoiding any degree of speculation regarding the McCanns’ responsibility in murder. La PJ n'a jamais dit autre chose. On the matter of public reactions to the Polícia Judiciária’s suspicions, the Público chose to quote one source who intimated that the McCanns were being subjected to a trial by media. The following vox populi not only provided a balanced report against other opinions, namely those also quoted in the Correio da Manhã portraying Kate McCann’s lack of visible suffering as a sign of guilt, but also stood as a statement against breaches of journalistic ethics and deontology: ‘I don’t believe the parents are involved [...] and I also think it’s wrong that journalists are accusing people’ (Público, 8 September 2007). The day before she was made arguido (a formal suspect) on 7 September 2007, the Correio da Manhã published quotes from local sources which implicitly acknowledged that Kate McCann could have been involved in the disappearance of Madeleine. Sources complained that they never saw her ‘shed a single tear’ and that she is ‘cynical and strange’ (Correio da Manhã, 8 September 2007). For the popular Correio da Manhã, the ‘guilt’, besides the McCanns’ alleged refusal to provide explanations for the supposed evidence, was based on Kate McCann’s behaviour. According to Correio da Manhã, quoting Polícia Judiciária’s sources, Kate could have been responsible for her daughter’s death (Dâmaso, Laranjo et al., 2007). In the period prior to the finding of bodily fluids, the McCanns were at most ‘guilty’ of negligence for leaving their children alone, but in this later period, the Correio da Manhã focused mainly on Kate. Since narratives tend to portray women as passive and maternal beings, belonging to a traditional imagery of femininity, the shift from the initial scenario of a mother’s loss to another acknowledging the possibility of filicide, elicits reactions of discomfort regarding the perverse paroxysm that human existence is capable of (Jewkes, 2004). Pondering the possibility that Kate might have been involved in Madeleine’s death the Correio da Manhã’s narrative searched for signs in her personality that would justify it, thus making it less disturbing for its readers who were given representations of a suffering mother. In Correio da Manhã, Kate McCann’s portrait shifted from ‘guilty victim’ – for the negligence that led to Madeleine’s disappearance – to ‘hysterical woman’. The Correio da Manhã developed the characterization of the new Kate, resorting to police sources who claim that during the interrogations she revealed herself to be ‘out of control’ and ‘having hysterical reactions’ (Dâmaso, Laranjo et al., 2007). The same article revealed testimonies claiming that she had ‘moments of aggressiveness towards her children’, uncontrolled emotions and even a tendency for violence, noting however that ‘the father, although more absent, revealed more emotional control’ (Dâmaso, Laranjo et al., 2007). These claims are in line with the criminal drama and the need to find justifications or motives for the offender’s conduct, which in the case of women are often sought within psycho pathological aetiologies (Cavaglion, 2008). The Polícia Judiciária played an important role in the construction of the Madeleine McCann case in the Portuguese popular press. Like in a CSI episode (4) in which the scientists/detectives constantly voice their theories and conjectures, explain laboratory procedures and conduct interviews with suspects, the Polícia Judiciária’s activities and opinions became the focus of attention for the Correio da Manhã. The main difference in the coverage of both newspapers was the use of official and named sources by the Público, as well as quotes from other ‘quality’ media agencies, whereas the Correio da Manhã frequently sought the opinions and statements of ‘sources close to the investigation’. The use of anonymous sources played an important role in the ‘trial by media’ insofar as it enabled the promulgation of hypotheses and theories which could not have received official endorsement. It also contributed to the public drama since the protagonists’ characterization was based largely on leaks and opinions. Because of the official secrecy laws regarding judicial inquiries, there wasn’t much information that the Polícia Judiciária could reveal to the public. However, there were many leaks to the press throughout the case, mainly in the Portuguese popular press that, apparently, had privileged contacts with the authorities. The scientific evidence had a strong impact in the trial by media, boosting speculation and innuendo around a possible involvement of the McCanns in their daughter’s disappearance, as well as keeping the media focus alive. In the analysed Portuguese newspapers we were able to distinguish different approaches of the importance and significance of the finding of DNA evidence. On the one hand, the Público’s approach reflected its ‘quality’ status by addressing a more educated audience. It didn’t portray DNA evidence as categorical proof of murder, but rather highlighted the probabilistic character of such evidence and the complexity regarding its interpretation. In a Q&A- style article, the Público explained that a ‘partial match’ in the Madeleine McCann case either means that the sample is degraded and a full profile could not be made or, if all markers are present in the profile, that the sample belongs to someone closely related, like a brother or sister. It also stressed that the DNA profiles of two randomly selected individuals can present common markers (Gerschenfeld, 2007). On the other hand, the Correio da Manhã adopted a more populist point of view in a discourse that built on images of efficiency and certainty associated with fictional representations of forensic science, namely CSI. The Correio da Manhã exploited and exaggerated the significance of scientific evidence, using the impressiveness of percentages in order to raise the impact of the supposed evidence, using the apparent scientific authenticity of percentages to heighten the impact of the supposed evidence, in the same manner that match statistics can be used to impress juries (Koehler, 2001). So, one day: ‘...there is a 78.95% with Maddie’s genetic profile’ (Laranjo, Marcelino et al., 2007), and a few days later, ‘there were traces of blood compatible in almost 100% with the missing girl’s’ (Machado, 2007). ‘Almost’ in the context of scientific evidence is quite vague, and we should note that they must have been referring to a correspondence in LCN. (5) This illustrates the lack of DNA criminal case experience in Portugal, compared with countries such as the UK or the USA, as well as the potentially exaggerated faith in the probative value and truth-finding capabilities of ‘scientific evidence’. The uncertainty regarding the significance and implications of the evidence provided further material for the public drama and trial by media. It also invited the audience to ‘take sides’ once again. The evidence was made to appear ‘strong’ to enable the change in the public’s perception of the McCanns from victims to possible suspects. The development of ‘public dramas’ and ‘trials by media’ can generate powerful moments of social effervescence. The construction of mediatized dramatic narratives surrounding criminal justice cases is particularly problematic insofar as the elicited collective energies are drawn to a need for closure or cathartic events that might restore social order (Cottle, 2005). The ‘public drama’ surrounding Madeleine McCann’s disappearance can be analysed through particular narrative devices such as the ‘defamiliarization’ and ‘objectification’ of the case’s victims (Peelo, 2006). By ‘defamiliarization’ Peelo (2006) refers to devices of ‘mediated witness’ that are employed in media narratives of murder. These are used in order to stir the emotions of readers and viewers, giving them a sense of involvement and personal experience which might be translated into thrill and excitement. The signalling of familiar objects and ordinary situations in the Madeleine McCann case, such as a ‘family on holiday’, ‘having dinner with friends’ or a child’s ‘plush toy’ were recurrently mentioned in the news articles as contextualizing pointers but also as emotional hooks. However, that which is familiar and close is transmuted into grotesque ‘otherness’ by a process of ‘defamiliarization’ (Peelo, 2006: 164), as that which is familiar is (re)presented with alternate meanings. The most obvious example of this is Madeleine McCann’s plush doll which Kate McCann carried everywhere, the Cuddle Cat, transformed from symbol of hope into signal of death. The notion of ‘objectification’ of crime victims relates to the portrayal of victims and co-victims as heroes or angels, a social process of anguish neutralization, as the victims are transmuted into the objects of the public’s expectations, allowing some sort of closure regarding the maintenance of order and the fulfilment of justice. In this sense, we analysed how the central characters of the Madeleine McCann case, namely her parents, were ascribed with different symbolic meanings as the case progressed. First, they were ascribed with the role of victims and heroes and on a later period as suspects and villains. This neutralization process allows society to concentrate its emotional energy in asserting the validity of its viewpoints regarding social order and its disruption. The frequent binary opposition or polarization between heroes and villains in crime news appears as a narrative device which provides metaphors for power relations in society (Ericson, 1991) allowing individuals the possibility to exercise their own moral competences (Katz, 1987). For example, with respect to the Madeleine McCann case, by providing the audience with clues and hypotheses, the media asserted the validity of individual viewpoints and the exercise of moral judgements regarding Madeleine McCann’s parent’s behaviour and public expressions of emotion (Cootle, 2005), fostering an ongoing trial by media. The dramatization and exploitation of human tragedy are almost certain ratings-winners and our analysis suggests that the popular press, represented here by the Correio da Manhã, developed an audience-appealing narrative. The tensions and conflicts between the justice system and the media that sometimes emerge during high- profile cases in the Portuguese context were somewhat muted by the pressure of foreign elements which prompted some media reactions to the external criticism and a dynamic of mutual instrumentalization between justice and the media. It is import- ant to analyse these dynamics as they take place in the eyes of the public and provide representations of the legal system as well as a contribution to the identification of the morally righteous characters in the media narrative. These relations had more actors than usual in the context of the Madeleine McCann case. On one hand, there were the institutional interests of the Polícia Judiciária, of the British police and their respective governments. On the other hand, some Portuguese and British media engaged in a sort of mediatized adversarial dispute where the competence of the Polícia Judiciária or the value of the evidence and the McCanns’ innocence was on trial. Il est douteux qu'on puisse parler de dispute. Les tabloïds britanniques, auprès desquels le Correio da Manha est un broadsheet, se sont déchaînés, à défaut de faits, contre la police portugaise, les institutions portugaises en général et la justice en particulier, enfin contre le peuple portugais lui-même. Personne n'a riposté, renvoyant à leur médiocrité ces détracteurs de pacotille. There was also an unusual element in this criminal case: the McCanns’ ‘media machine’. It may have been an additional pressure factor insofar as they were highly specialized and professional in the provision of information to the media. They were able to shape and mould the agenda in order to keep the case on the front pages and to maintain a constant pressure on the Portuguese authorities. Les auteurs ne pouvaient le savoir lorsqu'ils ont écrit cette communication, Madeleine's Fund a payé un demi-million de livres pour que l'affaire MC paraisse à la une des journaux britanniques pendant un an. When it became necessary, the ‘media machine’ played the role of an attorney in the trial by media by issuing formal statements or leaking information labelled as being from ‘sources close to the McCanns’, aiming to refute or to deny prejudicial claims and allegations. There were many other dimensions in this case that will probably become objects of sociological reflection. Nonetheless, the dynamics produced in this particular case stress the importance of a more open, transparent and efficient Portuguese justice system. The popular press’s reporting of the Madeleine McCann case may contribute to enhance the Portuguese citizen’s perception of a justice system which is vulnerable to pressure from powerful people. According to some national opinion polls (Santos et al., 1996; Cabral et al., 2003) evaluations of the justice system by Portuguese citizens frequently highlight concerns over corruption and the confidentiality and security of information found by criminal investigation (Costa, 2003), and low overall public confidence in political institutions and the criminal justice process when compared with other European nations (Contini and Mohr, 2007). Despite the McCanns’ access to exceptional resources and media experts, the more emotional coverage by the popular press resulted in an open-ended narrative where the mix of facts and conjectures was enough to raise collective doubt. Thus, there will always be someone who might question their innocence in the case of their daughter’s disappearance. Besides the public image and reputation of those involved, the Portuguese police and justice system’s reputation might have been somewhat tainted. It is likely that the Madeleine McCann case will become embedded in the collective memory in the manner of a ‘signal crime’ (Innes, 2004), thus affecting the way the media and the public will make sense of similar cases, as well as the responses and procedures of the investigative authorities. We believe the Madeleine McCann case may also produce impacts in the media–society–justice relations, which become visible within the distinction between quality and popular press. In spite of the absence of closure for the audiences, the Madeleine McCann case uncovered the need for reforms and change, particularly concerning Portuguese criminal investigation procedures and media relations. The Público developed some criticism, mostly in opinion articles, towards the unhealthy relations between investigative officers and the media. The lack of press offices working with the investigative authorities in Portugal is arguably a factor which fosters informal and anonymous news sourcing, thus raising speculation and mutual instrumentalization between justice and the media. On the other hand, the existing order was affirmed, mostly by the tabloid media which sustained a sort of moral appeal to the defence of the Portuguese investigative authorities and their theories, thereby asserting their competence and a sort of national and cultural identity. Contrary to the Público’s distanced and non-speculative stance towards the case and its underlying criticism towards the disproportionate and sensationalist media coverage of the case, this sort of posture by the Correio da Manhã appears as a non-reflexive and somewhat self-indulgent assertion of its perspective regarding the articulations between the media, the justice system and the public. It blurs the line dividing where ‘public interest’ becomes ‘interesting to the public’. It carries consequences for the principle of fair trial and the presumption of innocence. And it reinforces prevailing public perceptions of a slow and inefficient justice system (Santos et al., 1996; Fox et al., 2007). As sections of the news media reinforce the notion that justice is slow, unreliable and inefficient, the need to appease the public’s emotional reactions and the fast pace of news production may encourage media challenges to due process and its legitimacy, giving course to parallel exercises of justice’s functions (Commaille, 1994). The media’s increasing assimilation of an adversarial posture which defies the boundaries of legality and due process (Greer et al., 2008) is likely to affect the public’s views and confidence on institutional justice. Insofar as the media in western modern societies are the privileged place for the symbolical representation of authority (Ericson, 1991) the justice system’s representations by the media might subvert the democratic principle of trial publicity as it is being shifted towards a media arena where personal rights, rules of evidence or the presumption of innocence are frequently undermined by commercial/ideological interests under the pretence of ‘truth finding’ and public interest. Nevertheless, at least according to our analysis, the selected ‘quality’ paper was able to take a step back and avoid the vertigo of mediatized public drama and trial by media to which many others fell prey. The Público’s coverage ultimately shaped a different debate focusing on media excesses, journalists’ role in society and the relationships between justice and the media. The Correio da Manhã, by contrast, reinforced the notion of an inefficient and bureaucratic criminal justice system, contrasting the moral superiority and competence of the investigative officers with the ‘manipulative conspiracies’ of the established powers, while simultaneously celebrating its own role at the vanguard of public debate, institutional accountability and popular justice. The authors would like to thank the Foundation for Science and Technology (Portuguese Ministry of Science, Technology and Higher Education) for financing this research, in the project ‘Justice, media and citizenship’ (PTDC/SDE/67021/2006) hosted at the Centre for Social Studies, University of Coimbra. (1) The Polícia Judiciária is an investigative agency similar to the Criminal Investigations Department in many Commonwealth countries. (2) According to Article 57 of the Portuguese Penal Process Code, arguido is the status of the Individual against whom has been deduced a formal accusation or process of inquiry. Article 58 states that a person may be made an arguido based on grounded suspicions of crime. The arguido status of an individual is designed to provide certain rights, such as knowing the details of the charges or the right to remain silent during interrogations and to have a lawyer present at all times, and obligations that can go from a simple identity and residence statement to preventive prison, even if there is no formal accusation and an investigation is still under way. (3) These figures concern the proportion of a given category in relation to the other coded categories from the assumption that they are representative of the visibility of each category. (4) CSI: Crime Scene Investigation is a well-known North-American forensic science-themed TV criminal drama, which is very popular in Portugal. According to CBS’s show website, CSI ‘is a fast-paced drama about a team of forensic investigators trained to solve crimes by examining the evidence. They are on the case 24/7, scouring the scene, collecting the irrefutable evidence and finding the missing pieces that will solve the mystery’ (http://www.cbs.com/ primetime/csi/about/). (5) LCN – Low Copy Number – is a DNA profiling technique that is sensitive enough to render an analysis from a few cells (Gill, 2001). However the presentation of results cannot be simply given in terms of percentage, as a positive identification is based on a set of markers and further subjected to a ‘hierarchy of propositions’ in order provide reliable presentation of results (Gill, 2001: 203). Almeida, J.F., A.F. Costa and F.L. Machado (1994) ‘Recomposição Socioprofissional e Novos Protagonismos’, in A. Reis (ed.) Portugal: 20 Anos de Democracia, pp. 307–30. Lisboa: Círculo de Leitores. Altheide, D. (1992) ‘Gonzo Justice’, Symbolic Interaction 15: 69–86. Altheide, D. (2002) Creating Fear: News and the Construction of Crisis. New York: Aldine de Gruyter. Altheide, D. and K. Devriese (2007) ‘Perps in the News: A Research Note on Stigma’, Crime, Media, Culture 3(3): 382–9. Barak, G. (2007) ‘Mediatizing Law and Order: Applying Cottle’s Architecture of Communicative Frames to the Social Construction of Crime and Justice’, Crime, Media, Culture 3(1): 101–9. Berelson, B. (1952) Content Analysis in Communication Research. New York: The Free Press. Boltanski, L. (1999) Distant Suffering: Morality, Media and Politics. Cambridge: Cambridge University Press. Bourdieu, P. (1994) ‘L’Emprise du Journalisme’, Actes de la Recherche en Sciences Sociales 101(1): 3–9. Brown, S. (2003) Crime and Law in Media Culture. Buckingham: Open University Press. Cabral, M.V., J. Vala and A. Freire (2003) Desigualdades Sociais e Percepções da Justiça. Lisboa: ICS. Carter, C., G. Branston and S. Allan (1998) News, Gender and Power. London: Routledge. Castro, L. (2007) Por Que Adoptámos Maddie. Lisboa: Oficina do Livro. Cavaglion, G. (2008) ‘Bad, Mad or Sad? Mothers Who Kill and Press Coverage in Israel’, Crime, Media, Culture 4(2): 271–8. Cavender, G. and S. Deutsch (2007) ‘CSI and Moral Authority: The Police and Science’, Crime, Media, Culture 3(1): 67–81. Clayton, A., M. Hancock-Beaulieu and J. Meadows (1993) ‘Change and Continuity in the Reporting of Science and Technology: A Study of The Times and The Guardian’, Public Understanding of Science 2: 225–34. Cole, S. and R. Dioso-Villa (2007) ‘CSI and Its Effects: Media, Juries, and the Burden of Proof’, New England Law Review 41: 435–70. Commaille, J. (1994) ‘L’Exercice de la Fonction de Justice Comme Enjeu de Pouvoir Entre Justice et Médias’, Revue Droit et Societé 26: 11–18. Contini, F. and R. Mohr (2007) ‘Reconciling Independence and Accountability in Judicial Systems’, Utrecht Law Review 3: 26–43. Costa, S. (2003) A Justiça em Laboratório: A Identificação por Perfis Genéticos de ADN. Entre a Harmonização Transnacional e a Apropriação Local. Coimbra: Almedina. Cottle, S. (2005) ‘Mediatized Public Crisis and Civil Society Renewal: The Racist Murder of Stephen Lawrence’, Crime, Media, Culture 1(1): 49–71. Dâmaso, E. (2008) ‘Goody Two-shoes Journalism’, Correio da Manhã, 23 July. Dâmaso, E., M. Catarino, J.C. Eusebio and J. Saramago (2007) ‘PJ Suspects British Kidnapper’, Correio da Manhã, 7 May. Dâmaso, E., T. Laranjo, P. Marcelino, A. Lopes et al. (2007) ‘PJ Believes That Kate Killed Her Daughter’, Correio da Manhã, 10 September. Dias Felner, R. (2007) ‘The Campaign’, Público, 17 May. Ericson, R.V. (1991) ‘Mass Media, Crime, Law and Justice: An Institutional Approach’, British Journal of Criminology 31(3): 219–49. Ericson, R.V., P. Baranek and J. Chan (1991) Representing Order: Crime, Law and Justice in the News Media. Milton Keynes: Open University Press. Fernandes, J.M. (2008) ‘The End of the Maddie Case and the Beginning of Other Sins’, Público, 22 July. Fox, R.L., R.W. Van Sickel and T.L. Steiger (2007) Tabloid Justice: Criminal Justice in an Age of Media Frenzy. Boulder, CO: Lynne Rienner. Garland, D. (2008) ‘On the Concept of Moral Panic’, Crime, Media, Culture 4(1): 9–30. Gerschenfeld, A. (2007) ‘Questions & Answers’, Público, 14 September. Gill, P. (2001) ‘Application of Low Copy Number DNA Profiling’, Croatian Medical Journal 42(3): 229–32. Green, D. (2008) ‘Suitable Vehicles: Framing Blame and Justice When Children Kill a Child’, Crime, Media, Culture 4(2): 197–220. Greer, C., J. Ferrel and Y. Jewkes (2008) ‘Investigating the Crisis of the Present’, Crime, Media, Culture 4(1): 5–8. Guibentif, P., V. Gorjão and R. Cheta (2002) Comunicação Social e Representações do Crime. Lisboa: Centro de Estudos Judiciários, Gabinete de Estudos Jurídico-Sociais. Hamel, J., S. Dufour and D. Forti (1993) Case Study Methods. London: SAGE. Innes, M. (2004) ‘Crime as a Signal, Crime as a Memory’, Journal for Crime, Conflict and the Media 1(2): 15–22. Jewkes, Y. (2004) Media & Crime. London: SAGE. Karstedt, S. (2002) ‘Emotions and Criminal Justice’, Theoretical Criminology 6(3), 299–317. Katz, J. (1987) ‘What Makes Crime “News”?’, Media, Culture & Society 9: 47–75. Koehler, J. (2001) ‘The Psychology of Numbers in the Courtroom: How to Make DNA-match Statistics Seem Impressive or Insufficient’, Southern California Law Review 74: 1275–305. Laranjo, T., H. Machado, P. Marcelino and J. Saramago (2007) ‘Suspected of Killing and Hiding Maddie’, Correio da Manhã, 8 September. Laranjo, T., P. Marcelino, A. Lopes, H. Machado and J. Saramago (2007) ‘Exams Thoroughly Analysed by PJ and Scientists’, Correio da Manhã, 29 November. Machado, H. (2007) ‘Maddie’s House’, Correio da Manhã, 16 September. Marcelino, P. (2007) ‘McCann Couple Prays in Rome’, Correio da Manhã, 30 May. Mendes, H. (2003) ‘Visibilidade da Ciência nos Mass Media: A Tematização da Ciência nos Jornais Público, Correio da Manhã e Expresso (1990 e 1997)’, in M.E. Gonçalves (ed.) Os Portugueses e a Ciência, pp. 32–78. Lisboa: Dom Quixote. Moura, P. (2007) ‘Why Have We Adopted Madeleine?’, Público, 3 June. Peelo, M. (2005) ‘Crime and the Media: Public Narratives and Private Consumption’, in M. Peelo and K. Soothill (eds) Questioning Crime and Criminology, pp. 20–36. Cullompton: Willan. Peelo, M. (2006) ‘Framing Homicide Narratives in Newspapers: Mediated Witness and the Construction of Virtual Victimhood’, Crime, Media, Culture 2(2): 159–75. Reiner, R. (2001) ‘The Rise of Virtual Vigilantism: Crime Reporting Since World War II’, Criminal Justice Matters 43(1): 4–5. Reiner, R. (2002) ‘Media Made Criminality: The Representation of Crime in the Mass Media’, in M. Maguire, R. Morgan and R. Reiner (eds) The Oxford Handbook of Criminology, pp. 376–416. Oxford: Oxford University Press. Revez, I. (2007) ‘News About Possible Responsibility of Madeleine’s Parents Cause Booing and Hooting’, Público, 8 September. Revez, I. and A.A. Mesquita (2007) ‘Parents Suspected of Involvement in Corpse Concealment’, Público, 8 September. Rich, A. (1986) Of Woman Born: Motherhood as Experience and Institution. New York: Norton. Robbennolt, J.K. and C.A. Studebaker (2003) ‘News Media Reporting on Civil Litigation and Its Influence on Civil Justice Decision Making’, Law and Human Behavior 27(1): 5–27. Sacco, V.F. (1995) ‘Media Constructions of Crime’, Annals of the American Academy of Political and Social Science, 539: 141-54. Santos, B.S., M.M. Leitao, J. Pedroso and P.L. Ferreira (1996) Os Tribunais nas Sociedades Contemporâneas: O Caso Português. Porto: Afrontamento. Sparks, C. (1992) ‘Popular Journalism: Theories and Practice’, in P. Dahlgren and C. Sparks (eds) Journalism and Popular Culture, pp. 24–44. London: SAGE. Surette, R. (1998) Media, Crime, and Criminal Justice: Images and Realities. Belmont, CA: Thomson/Wadsworth. Surette, R. and C. Otto (2002) ‘A Test of a Crime and Justice Infotainment Measure’, Journal of Criminal Justice 30: 443–53. Vinson, D. and J.S. Ertter (2002) ‘Entertainment or Education: How Do Media Cover the Courts?’, The Harvard International Journal of Press/Politics 7(4): 80–97. Webb, R. and J. Daniluk (1999) ‘The End of the Line: Infertile Men’s Experiences of Being Unable to Produce a Child’, Men and Masculinities 2(1): 6–25.